1. constitute: to constitute something is to form a whole, especially of dissimilar components: Love and hate can constitute a balanced relationship. -Seven days constitutes a week (七天構成一個星期。). 2. 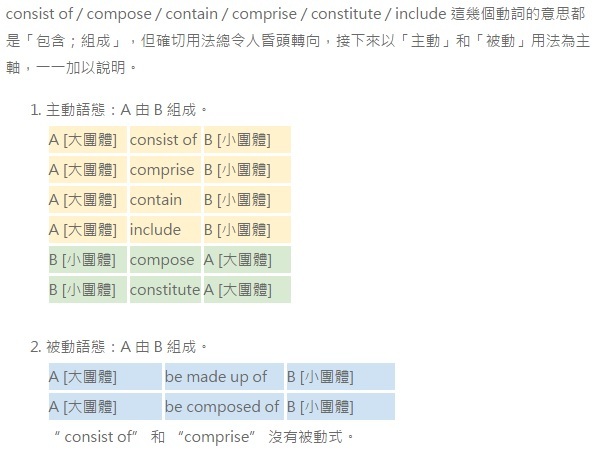 Compose: to compose means the same as to constitute, but implies that the components have something in common: Water is composed of hydrogen and oxygen. These products, in total, account for about 80％ of all our sales (這些產品總共約占我們全部銷售額的80％。). -The committee is made up of representatives from every state (委員會由每個州的代表組成的。). -Children makes up only 10% of the population (兒童只佔人口的10％。). 5. consist of: to consist of something is to be made up of it: A lethal dose of nerve agent VX consists of only 10 milligrams. -This group consists of men, women, and children. 6. comprise: to comprise something has the same meaning as to consist, often implying that the whole is regarded from the point of view of its individual parts: The chain is comprised of many links, and is only as strong as its weakest. -The committee comprises men of widely different views (這個委員會由見解甚為懸殊的人組成。). England, Wales, Scotland, and Northern Ireland compose/constitute the United Kingdom. -The United Kingdom comprises*/consists of/is composed of England, Wales, Scotland, and Northern Ireland. *An interesting history of sense development concerning the word comprise has caused confusion, if not hate for the word itself. The most common mistake is confusing consist and comprise with each other. To say A lethal dose of nerve agent VX comprises of only 10 milligrams, is wrong because it is not analyzed from each separate component or milligram, but rather as a whole dose. In fact, there is a lot of skepticism and criticism of the word “comprise” all together. “None of the many neat schemes purporting to describe its correct use seems accurately to describe the way Standard English users actually employ comprise.” (Bartleby) Thus it is suggested to use constitute and/or compose as active verbs, while consists and/or includes as passive. However, if your use of the word can clearly indicate its context, separate from the its other accepted use, choosing a substitute is not necessary. Also, ”Comprises” is “better" grammar than ”is comprised of.” “The whole comprises multiple parts” is better than, “The whole is comprised of multiple parts.” Even better though is, “Multiple parts comprise the whole." -The pie chart consists of/comprises of the percentages of four different fuel sources used in electricity production. -Electricity (that is) produced with coal composed/constituted/accounted for 50% of the total electricity (that is)produced. Contain: Something is considered to be within something else. The toy contains many small moving parts. ->The small moving parts are a part of the toy. Include: Something is added to something else, possibly containing it, possibly not. -This toy includes batteries. -> The batteries are not a part of the toy. They just come with the toy.